APSU biology student Eva Grebe presents research in Washington, D.C.
Clarksville, TN – Earlier this spring, a bidding war erupted on the Austin Peay State University campus. Specifically, several different departments were fighting over the honor to pay for biology student Eva Grebe to attend the annual Council on Undergraduate Research’s Posters on the Hill Convention in Washington, D.C.
Only 60 out of 800 applicants nationwide are accepted to attend the convention. Grebe was the only Tennessee college student to be invited. APSU student Eva Grebe is interviewed about her research during the Council on Undergraduate Research’s Posters on the Hill Convention in Washington, D.C.
Dr. Don Dailey, chair of the APSU Department of Biology, sent out an email in March congratulating Grebe and telling her the Department would be able to cover her travel expenses. Then, Dr. Steve Hamilton, director of the APSU Center of Excellence for Field Biology, sent an email. 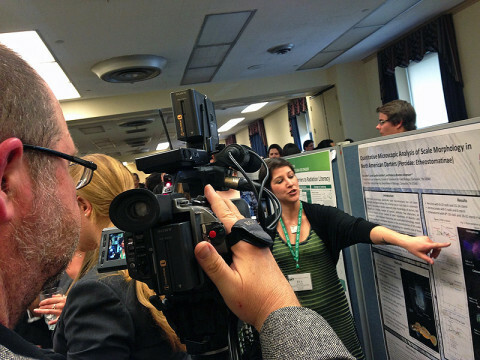 Both departments ended up splitting the cost, allowing Grebe to present her research to members of the U.S. Congress and other high-level government officials. Grebe spent the last year studying the scales of small freshwater fishes called darters, and her work could show that North America has a much more diverse fish fauna than is currently known. “With this project she has been able to contribute to this area of ichthyology that’s very important to understanding the relationships of these fish to one another, but also in the project she’s been able to develop skills on an important kind of tool that’s applicable to many areas of biology,” Dr. Sarah Lundin-Schiller, APSU professor of biology, said. Grebe used the University’s new confocal microscope, which allows users to see three-dimensional details in biological specimens. The microscope, funded by the University’s technology access fees, is the type of tool usually reserved for professionals and graduate students. “Our undergraduates get to use it, and this gives them a skill set that sets them above undergraduates coming out of bigger institutions,” Lundin-Schiller said. Dr. Rebecca Johansen, APSU associate professor of biology, praised Grebe as “being very well organized” and a self-starter, and said she represents a new class of student at APSU. Grebe went to Washington, D.C., last month and spent several hours showcasing her research and promoting the University and its efforts to elected officials. She met briefly with Tennessee Senators Bob Corker and Lamar Alexander and U.S. Representative Marsha Blackburn. She also spent some time with U.S. Representative Phil Roe, an APSU alumnus. Grebe’s undergraduate research experience at APSU has also helped with her future academic aspirations. She received a competitive National Institute of Health Fellowship for $36,000, which will cover her tuition and cost of living while attending graduate school at San Francisco State University. For more information on Grebe or undergraduate research, contact Gentry at . Topics: APSU, APSU Alumni, APSU Center of Excellence for Field Biology, APSU Department of Biology, APSU Office of Undergraduate Research, Austin Peay State University, Bob Corker, Christopher Gentry, Clarksville TN, Don Dailey, Eva Grebe, Lamar Alexander, Marsha Blackburn, Microscope, National Institute of Health Fellowship, Phil Roe, Rebecca Johansen, San Francisco State University, Sarah Lundin-Schiller, State Senator, Steve Hamilton, Tennessee, U.S. Congress, U.S. Senator, Washington D.C.